While the Red and Blue albums certainly shimmered with moments of grand brilliance, the masterful Yellow & Green is Baroness' most complete majestic offering to date. Filled with melodious surprises the new platter is genius from alpha to omega — no small feat considering its 1.2 hour play time spread over 18 disparate yet somehow analogous sonic puzzle pieces. 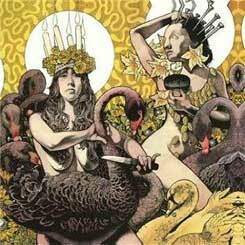 Where Baroness rise above their peers is in their expert use of dynamics. The band's best trick is an uncanny ability to lull listeners into a hypnotic state with delicate droning passages only to boisterously break trance an instant later with a wall of fuzzed out intellectual cacophony. Lush layers of sonic bliss carry voices that bellow melodiously as they wind though and crash over mountains of solid rhythmic groove. Guitars jangle like the Cure on quaaludes as effectively as they harmonize in Lizzy-esque flourishes only to refrain to a grungy wall of dissonance. Occasional acoustic interludes hint at the group's Georgian heritage with a blue grass hue that acts as sinew binding the muscular riffs that surround. Cuts like "Take My Bones Away" and "Board Up The House" resonate as obvious singles in their deft popish swagger. Meanwhile the gorgeous "Eula" ebbs and flows, nodding to emo's 2nd wave when the term referred to emotional maestros like Sunny Day Real Estate, not foppish swoop haired scenesters. If a vinyl version of "Yellow & Green" were left to slightly warp on a dashboard before being played through a dirty needle, the instrumental sections of "Psalms Alive" might be mistaken for a lost B-side of Drama-era Yes. The album is that quirky. Where it all coalesces is on "Cocanium." This pièce de résistance ramps from Syd Barrett worthy art rock mystique until a final minute crescendo that Hetfield might have coined had he remained in the garage rather than hitting the metal lottery. Drums and bass are on lockdown, playing off each other in a way not unlike those scenes from "Song Remains The Same" where John Paul and Bonzo seem to be holding their own private concert while the crowd focuses on the pretty stars. The final star of this show is the consistently brilliant and magnetic artwork of vocalist/guitarist John Baizley. For anyone considering downloading this opus, the smart money is on purchasing the discs. Two CDs with amazing iconic imagery woven through a booklet of insightful lyrics...all for under $10? Someone would have to be stoned not to buy this album. RATING - 95/100 - Much respect to Baroness for bravely following their prog muse and sloughing the constricting skin of stoner cliches that bury genre hopefuls in pits of molasses. Moving toward the center with emphasis on hooks while maintaining a legitimate artistic integrity is a shrewd career move that should position these dark horses in the race with major label mainstreamers Mastodon & QotSA.